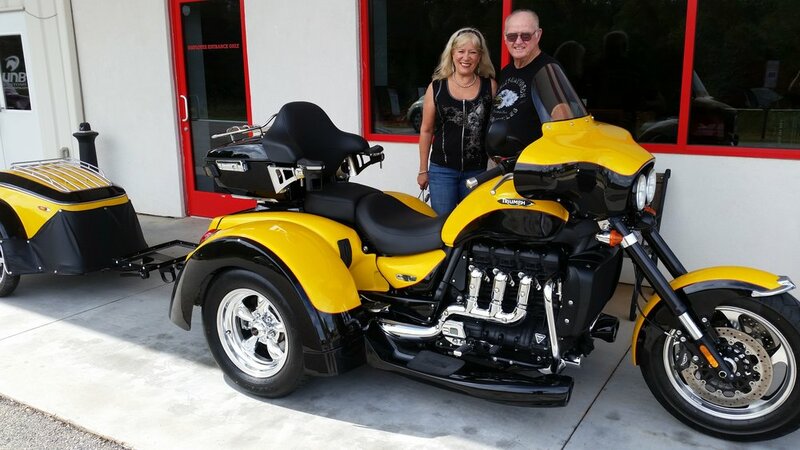 We first met Larry and Iris Smith when they came by the shop one day to have some work done on their 2012 Harley Ultra Limited Roadsmith trike. We fixed them up and they were on their way. A year or so later they returned for some service work and happened to notice a Triumph trike we had just completed. Sparking some interest in a new ride, Larry starting researching Triumphs. Not long after he showed up with a brand new bike and plans to have us custom install a Motor Trike Rocket III trike kit on his Triumph. Like you and I, he was not satisfied with a stock motorcycle trike. Larry wanted to make it his own. Once we got started on installing the Motor Trike kit, he began coming up with ideas to customize his new trike. Some of the major customization requests were a fairing, not available from Triumph. A tour pack for additional luggage and more comfortable seating, not available from Triumph. Running boards, not available from Motor Trike. And a custom two tone paint job. Uwe and Kent got to work making these happen. First finding a fairing that would fit over both headlights and on the forks. Then finding a tour pack that looked good and making a mount to hold it, and finally modifying the body so it sits looking good and functional. We then got to work on the running boards. 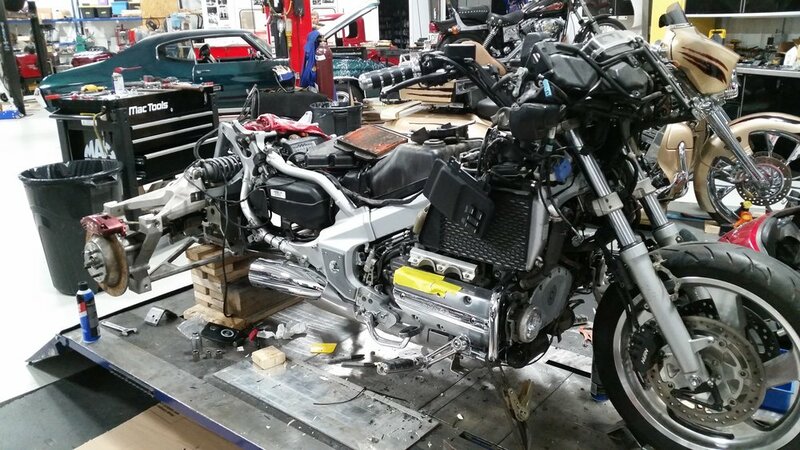 Modifying a pair to fit both on a new body and motorcycle as well as the support brackets to hold them. After the fitment came the custom paint. Two tone yellow and black to really make this trike pop. 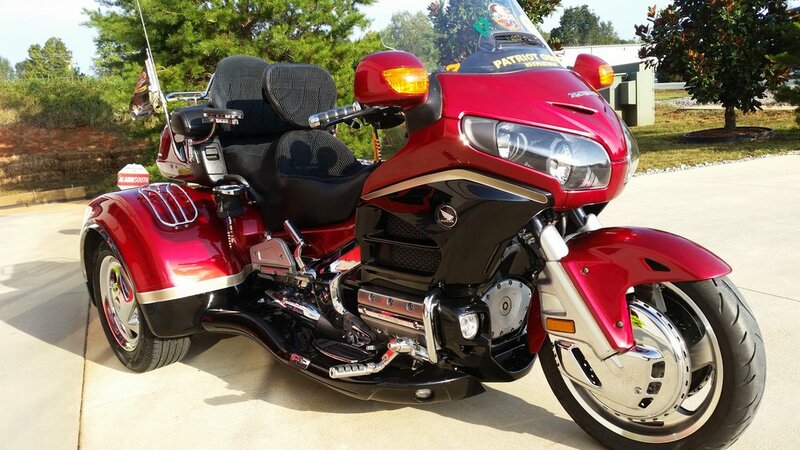 Larry and Iris plans to travel long distances on the trike led them to purchase a pull behind motorcycle trailer. We all know it had to look as good as the trike. So UNB got to work painting that to match the trike. 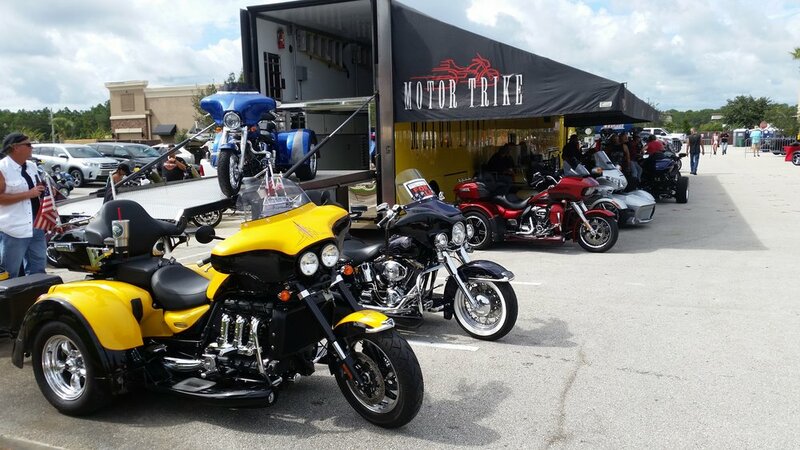 The Triumph trike was a hit in Daytona Bike Week since no one had seen one like this before! 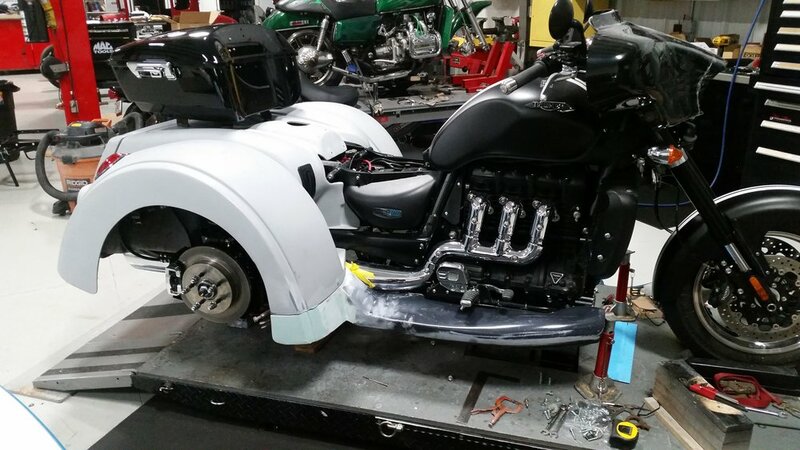 Larry and Iris’s Triumph Rocket III trike is amazing and one of a kind. We put in a lot of work to make it exactly how they wanted it and couldn’t be happier about how it turned out. Enjoy it for many many miles!